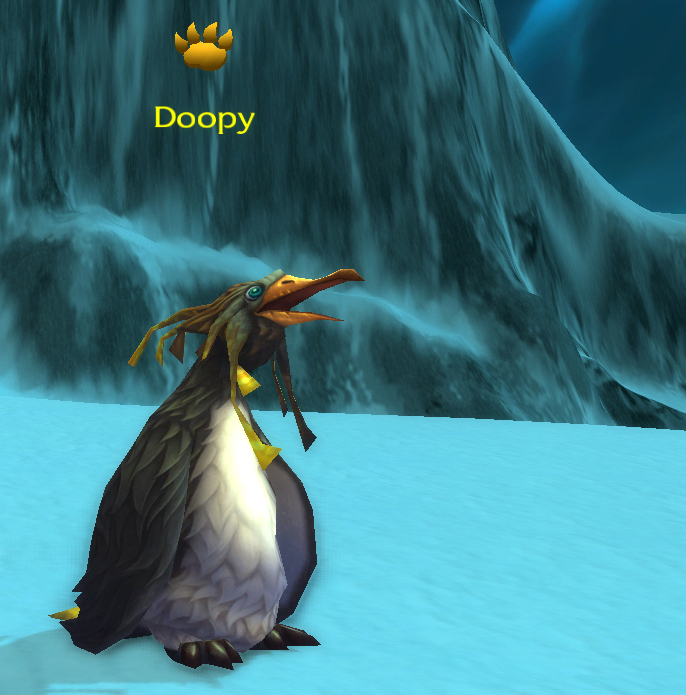 Doopy is a legendary battle pet located in Icecrown. The roughest part of this fight is stumbling across him. He’s in an out of the way location, and there’s really nothing to point you to the fact that he’s there. The fight itself is relatively straightforward. Doopy is an aquatic penguin with Slippery Ice, Ice Lance & Ice Tomb. He also has the standard 50% damage reduction buff given to many pets nowadays. Each component is able to be countered relatively easily. Here’s 1 team I’ve chosen to highlight. The key here is strong Flying attacks. Since Doopy is Aquatic, as long as you have a lot of Flying firepower you should be able to take out this solo battle pet relatively easily. The Nether Faerie Dragon‘s main trick here, other than its off-family flying damage, is Life Exchange. 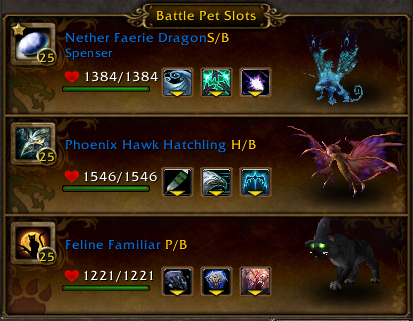 Life Exchange is fun for single-pet fights though it’s fairly unnecessary. The Phoenix Hawk Hatchling is well suited to this fight. It has both Lift-Off to dodge Doopy’s Ice Tomb, and Fly By, which increases damage dealt by 25%. Ice Tomb is going to annihilate your pets with both big damage and a stun, so dodging it is a good thing, and it’s relatively easy. When the counter says there’s 1 round to go on Ice Tomb, use your Lift Off and your pet will dodge both. Same for any other dodges or absorbs on other pets. Of course, increasing damage dealt always a plus. The Feline Familiar is in there, perhaps a bit oddly, because Doopy’s bread & butter move is Ice Lance, which uses multiple relatively smaller hits. As a result Stoneskin is good to use on an anchor. The old standby the Anubisath Idol or Emperor Crab make decent anchors too. I’ve beaten Doopy handily with a bunch of owls, a trio of moths, a fistful of chickens, etc. Ravens & Crows are extremely useful in this fight, if you have one available. In general I’d really recommend to just use a bunch of pets with Flying damage, but I’m putting out as many options as possible, because this is a pet a lot of non-pet battlers are going to want to beat. Actual pet battlers? Funnily enough, not so much. Each time you beat Doopy, you get a special egg item. It goes directly into your bags & is mailed to you if they’re full. 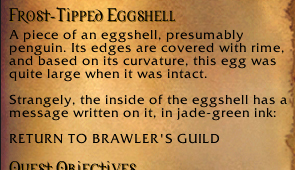 This egg unlocks a new boss at the Brawler’s Guild, and it’s your only reward for besting Doopy besides the satisfaction of a job well done. 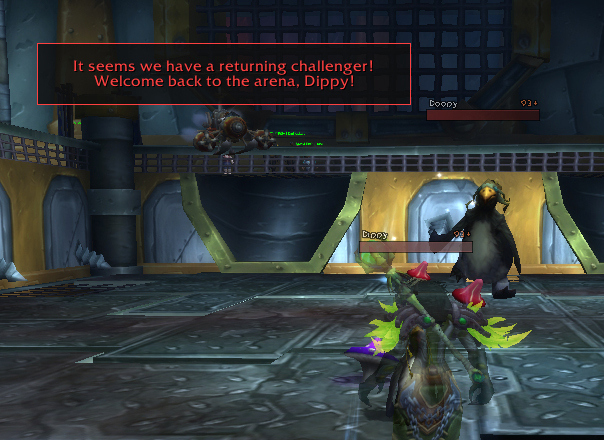 The boss itself combines the earlier Dippy fight from rank 1 with Doopy, and in my case the result is kind of a mess. A gory, gory mess. Nice knowing you. 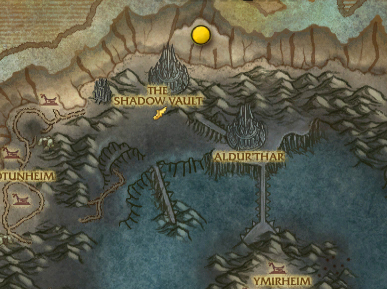 This entry was posted in strategy on July 22, 2014 by Liopleurodon.